This landmark address by the Abbot of St. Tikhon of Zadonsk Monastery is one of the primary motivators behind the effort to launch The Northern Thebaid Pilgrimage Project as quickly as possible. The Project can help foster a “culture of monasticism” in the Church, one which continually turns our hearts and minds towards prayer, pilgrimage, and the one thing needful. 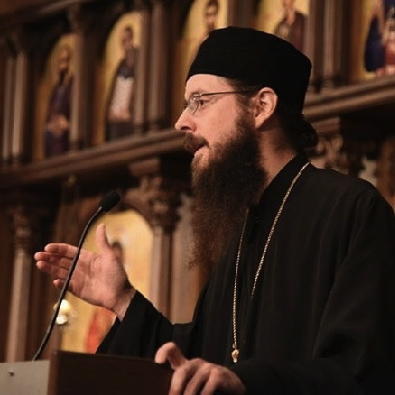 During the 6th Plenary Session of the 18th All-American Council of the Orthodox Church in America, Archimandrite Sergius, the abbot of St. Tikhon’s Monastery in Waymart, PA addressed the delegates concerning monasticism and its role in the contemporary American Church. His address is of interest to all the faithful for as he noted both monastics and married laity are “called to live 100% for our Lord 100% of the time,” and the monastic life has traditionally been accepted as the inspiration for the laity. As St. John of Climacus wrote: “Angels are a light to monks, and the monastic life is a light to men.” The health of the Church in a particular area can be measured by the health of monasticism in that area, and thus the relation of monastic life to the greater Orthodox Church in America is one that concerns all the faithful. The first and most important point is to “Never disdain or discourage any vocation” to monasticism, the priesthood or any clerical office. To do so will hinder the call of God in that person’s life. Archimandrite Sergius secondly encourages pilgrimages to monasteries to benefit from the spiritual atmosphere there and, finally, to be inspired by the example of prayer that monasteries set for the Church. We, as members of Christ’s body, can and must support the building and growth of monasteries and monastic vocations. By so doing, we invest in the well-being and preservation of the Church as well as in the “churching” of America. Through the monasteries, organic Orthodox life will grow and flourish, and acting like a catalyst, it will empower and inspire local parishioners to give more of their own hearts and lives to God and to prayer. The power that emanates from a monastery is not only real and tangible, it is intensely powerful, life-creating and life-changing. Somehow, the process of pilgrimage is key to the success of that effort. “Therefore”, Fr. Ambrose urges us, “we must have an understanding of the ‘inner’ pilgrimage, the pilgrimage within our hearts,” the pilgrimage which leads to repentance and conversion. Venturing on holy pilgrimages to the sacred monasteries across North America can help transfigure and change our hearts, so that we, in truth, may begin to live our entire life as pilgrims sojourning towards our heavenly homeland. Fr. 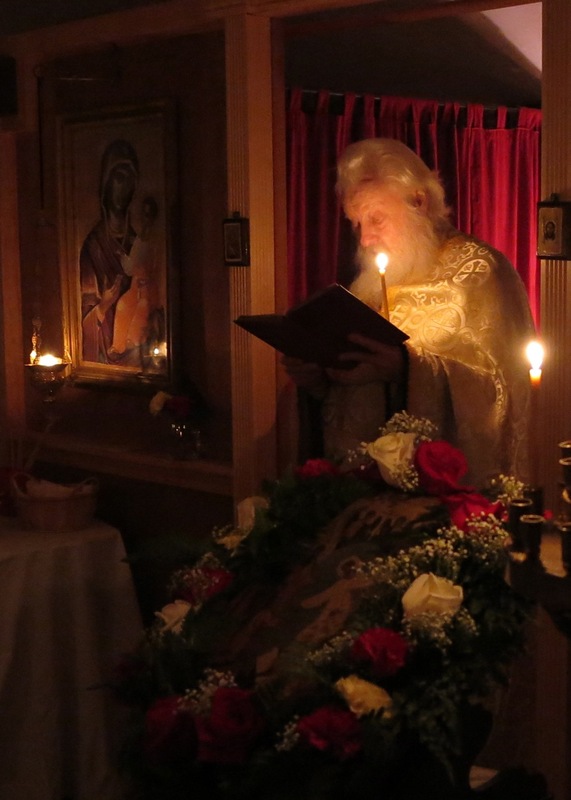 Ambrose, Pascha 2013; Skete of the Entrance of the Theotokos, Hayesville OH. by Schemahieromonk Ambrose (Young), of the Entrance of the Theotokos Skete, Hayesville OH. In today’s world, especially in Europe and America where there is a certain amount of affluence, individuals and families do not go “on pilgrimage”; they “take vacations.” They go skiing, or they go to Disneyland, or they travel as tourists to see some interesting — but usually non-Orthodox, non-religious — places and sites. Our forefathers in the old countries, however, knew nothing about such things as vacations; they only knew about pilgrimages. They lived longing for the day when they could go on a pilgrimage to the shrine of some wonderworking icon or a saint. This was their concept of a vacation — something that would nourish the soul rather than give rest to the body, for the body, they knew, would soon disappear into the grave, when the soul would go on into eternity and there find its reward or punishment, according to the way of life it had led with the body on this earth. The title of this article is “What is a Holy Pilgrimage?” Such a title suggests that there is such a thing as a “holy” pilgrimage as opposed to an “unholy,” profane, or secular journey.